Creating for Mental Health — Paper Rose Co. If I sum it up, what brought me back to Paper Flowers two years ago was my mental health. I needed a way to break some bad habits and my inexplicable need to be working at all times—which at that point, was not also very fulfilling or rewarding. So instead, I decided to start spending my evenings teaching myself how to make something new. Seeing something tangible in my hands, and having something beautiful to enjoy as a result of my time was uplifting. It motivated me to focus and more swiftly move through my daily tasks so that I could enjoy my free time in the evenings—creating for myself and not my clients. I'm fortunate to be at a place in my life and career where I have been able to turn this rediscovered connection with paper flowers into a business, but in many ways, not much has changed. I still spend most of my days running a business—it's stressful, and it's a lot of work. The good news is I find so much relief and joy in the making portion of what I do. Working with my hands, creating something beautiful, seeing a finished product that I not only can enjoy, but others do too. These are the parts of my days I look forward to and am striving to extend. That said, I realize I've been sliding back into old habits. Not taking any time off, focusing way too much on work, staying up way too late at night to stay on schedule. I know I need to make some changes before I burn out again. Last night I returned from a week-long trip with my college roommate and friends to celebrate her birthday. When she first asked me to join her, I thought the idea was absurd, but my husband talked me into it: “There will never be a good time to take a vacation,” he reasoned. And he was right! There will always be a reason to keep working, especially when you work for yourself. But man, am I glad I went! I packed sketchbooks, and books, a brand new watercolor kit and pens, loaded my iPad with video tutorials about drawing and podcasts about creativity—and I never opened a single one of them. I just swam, listened to the ocean, and let my mind wander (mostly about fish tacos) for seven days straight. It was just what I needed. My brain needed a hard reboot. As we were sitting on the beach yesterday (or was it Tuesday? what day is it?) I listened to the other people in my group talk about the meetings they had to go back to and the work travel they had coming up, and the dread they were experiencing for having to return to their daily life. And I realized how lucky I am to feel none of that. The first thing I did when I got to my desk this morning was turn on kexp (as I do every work day), and I noticed they were broadcasting their music heals programming for world mental health day. It sparked me to reflect on this past week and how grateful I am to have connected and discovered my talent and love for paper flowers. I'm so excited to be home and back in my studio—that’s me in the photo above, freshly freckled and happy to be back with my rolls of crepe paper! Now I know my issues with stress and anxiety are different than everyone else's and that work isn't always the problem; however, I do feel strongly about finding a creative outlet that works for you. Having a hobby to connect with, escape to, or dig into is so important to me. I wish everyone would find the one (or ones) that work for them. I've also vowed to start dipping back into some of my other interests to ensure I continue to enjoy my work as much as I do and to make sure I'm keeping my mental health in check moving forward. 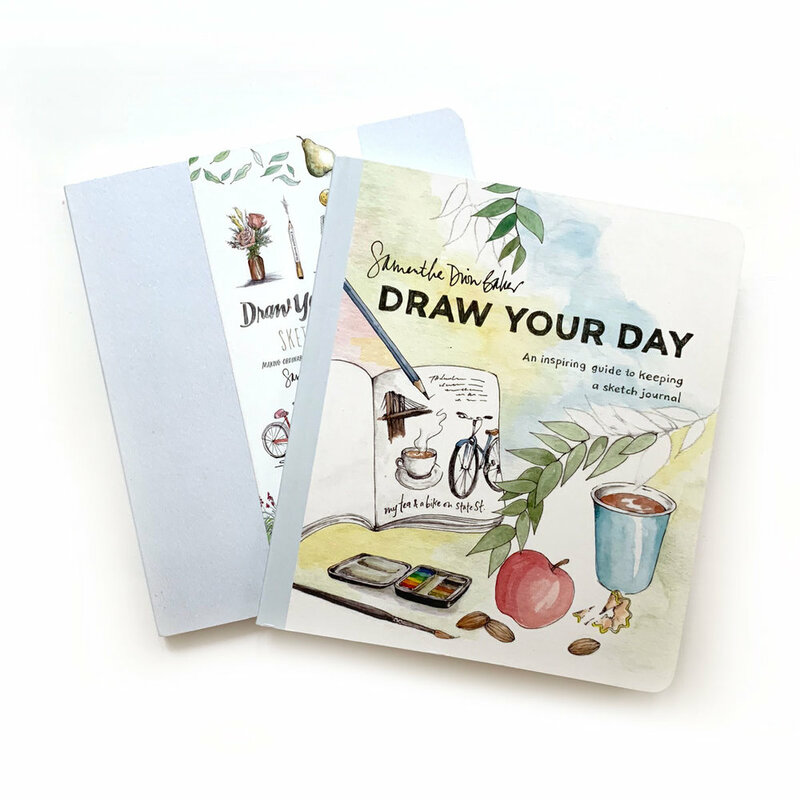 Draw Your Day and accompanying Sketchbook by Samantha Dion Baker: I admire those who keep up with a daily journal, and even more so those who do so in a sketched format. The joy I get from flipping through this book alone is worth the investment! The Crafter's Box: I added this subscription to my list last winter with a candlemaking workshop and have discovered several new artists and mediums since then. The kits come with video lessons by the featured experts and include everything you need to complete the project as curated by them. The perfect way to discover new crafts and hobbies! Modern Florals by Alli Koch: despite my years of study in art and design, and love of all things botanical, I really can't draw to save my life. This book goes step-by-step to show you how to draw lots of different types of flowers, and I find it a fun way to unwind. The Gift of Calligraphy by Maybelle Imasa-Stukuls: I was fortunate enough to receive an advance copy of this book from Penguin, and it is positively stunning. I haven't worked on any of the lessons yet, but there are many I'm excited about trying, and it has re-sparked my interest in calligraphy. Archer & Olive Dot Grid Notebook: Now I am super picky about my sketchbooks, and this was a pleasant surprise discovery (found through an IG ad, nonetheless!). The paper is super thick, the grid is just right (not too prominent), and size was great for a carryon (right around an A5). What made me most happy is that it genuinely does lay flat (they always say they do, but don't), and the flowery cover is leather so it will hold up. My Life in Color by Brittany Watson Jepsen: This book arrived not long before I left town, and is the companion to the Craft the Rainbow (another one for this list! ), only it is more of a workbook, which I love. I haven't spent too much time with this one yet, but I'm looking forward to it! And then finally I would be remiss if not to suggest paper flowers, of course! If you're interested in learning to make paper flowers and want to sit down with me for a few hours in a couple of weeks, you can also sign up for my Workshop in Richmond. I designed this class to be the perfect jumpstart session so that you can start successfully making flowers on your own (and start seeing the benefits I enjoyed right away too!). I hope you like this list and I'd love to see what other ideas you have, so if you have other suggestions to add, leave a comment or send me a note! Most of all, I hope you are finding a way to take care of yourself and your mental health today, and every day.